... "Ms. Pumcharoenwatna relies on one chef and three additional cooks who take turns producing flavorful dishes that rely heavily on pastes ground in house and fresh herbs like lemon grass, basil, cilantro and Kaffir lime leaves. If you have never had the pleasure of tasting Thai food, then you must make Pimaan your first foray into this savory and spicy dining experience. Soups, satays, noodles and fried rice are among the fare with standouts like the drunken noodles and the spicy jungle curry. We were looking for good Thai in Bergen County...We found it! The staff was incredibly friendly and accomidating. The atmosphere was warm and inviting and tastefully done. We ordered the Tom Yum and Tom Kha soups. Both were extremely flavorful. For entrees we had basil chicken, chicken with baby corn, and beef Pad See-ew. They did make one mistake bringing us the wrong entree, but corrected it immediately (great service). The meals were all very tasty. If I'm ever in the mood for Thai in Oradell, this will be my go to place. We've been steady customers since 2006 and this place never fails to please! I love the Pad Gra Prow with shrimp extra spicy and the lemongrass soup, which knocked more than one cold out of me this winter! My little one loves the Chicken Satay and crispy spring rolls, so much so that I deliver this as lunch to her school. The Summer Rolls are also delicious - like little mini salads wrapped in thin rice paper with delicious dipping sauce. No matter what you order, it's five stars all the way! Hands down the best Thai food in North Jersey. Been coming here for years and I love this place. Fast and friendly service and on top of all, delicious food. "Favorite Thai food in the area! It's quick, authentic, and delicious (to say the least!!). The spring rolls, the tofu appetizer, to the soup and drunken noodles- all are my go-to's"
"I find it very difficult to find unique and consistent Thai cuisine. That being said.. Pimaan is my favorite Thai restaurant in and out of NYC and the surrounding tri-state area. Plating is amazing. Flavor is top notch. Their menu is A-typical when it comes to Thai food. They have more than just the traditional currys, soups, salads and pad thai. They actually have soft shell crab as an appetizer and entree and my favorite on the menu.. another rare item for Thai restaurants...THE LAMB CHOP!! The menu is extensive. This is a family run business and the owner is just the nicest guy! Great prices. Good service. This is a must try for anyone who likes Thai food or even just a fan of Asian cuisine made with love. I rarely give 5 star reviews but their consistency or service and food quality for over 15 yrs makes this an easy 5 start review. BEST THAI IN TRI STATE including NYC! PERIOD! I do not go anywhere else to eat Thai Food!" 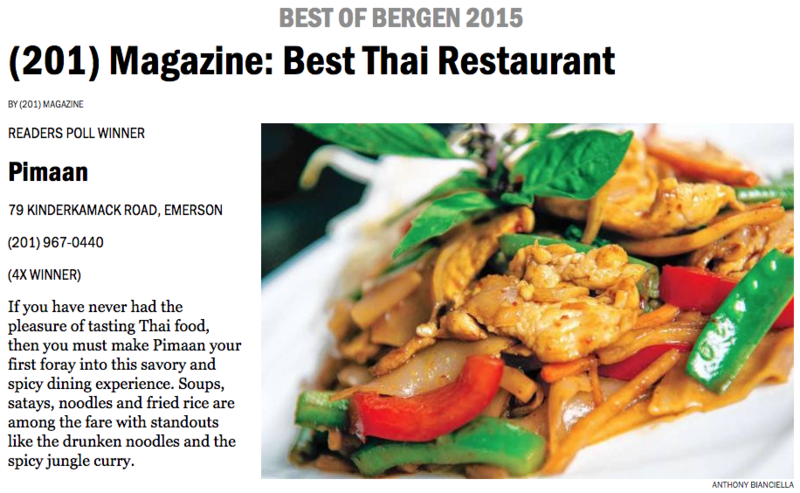 "Perhaps the best Thai restaurant in New Jersey. I am a regular at this place, the food is simply amazing. If you enjoy authentic Thai food you will love this restaurant. The appetizers are great; try the spicy beef salad and crispy spring rolls. The duck basil is my favorite! To make things even better the restaurant is BYOB. Make sure to grab a bottle of chilled Galician Albariño it is the perfect pairing for spicy Asian fare. If you are unable to get Albariño dry Riesling should do just nicely. The place gets crowded on Friday and Saturday nights make sure to make a reservation well ahead of time." "This place is just awesome. After dining in Thai places all over NYC-this place is better than the best NYC has to offer. I have been here numerous times and never been disappointed. Food and service are consistently top notch. Ingredients are super fresh and the presentation is always exquisite. 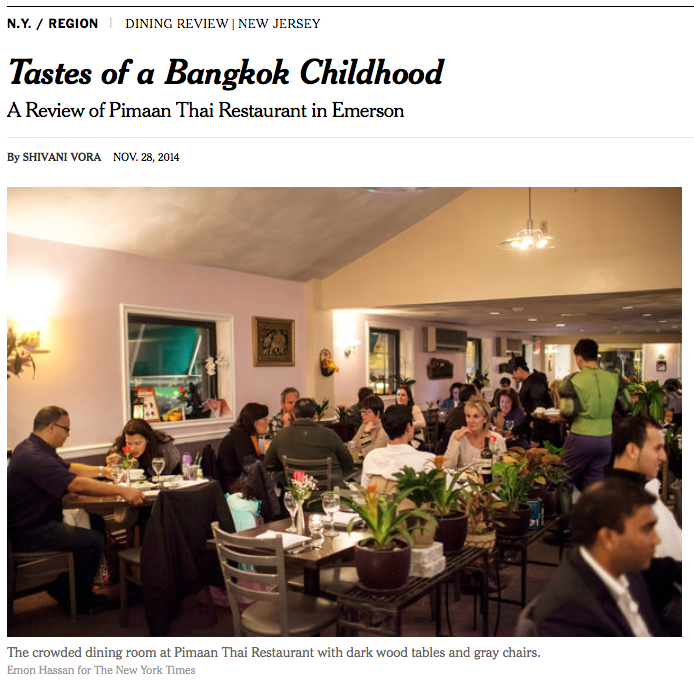 If your are looking for good authentic Thai food-save your time and gas money-Emerson is where its at." "This is definitely one of the most authentic and delicious Thai food restaurants I've eaten at EVER..not just in this area. The staff is polite and efficient..I have never had to wait long for my food. I would recommend this place for a work dinner, a date, or a special family occasion. It's very clean, nicely decorated and the portions are generous." "As good as it gets is an understatement. The wait staff are incredibly hard working and attentive. I enjoy spicy food and they never let me down in that respect. I have tried a number of their items and have never been disappointed. My favorite items are: tofu satay (grilled tofu on skewers, not always on menu), summer rolls (incredible flavor and great dipping sauce), spicy tofu, drunken noodles, red/green curry and fried calamari (INCREDIBLE!!). This is easily the best Thai restaurant in NJ. Nothing comes close. The prices are great, the service is great, decor isn't bad (but isn't that great, but who cares, you go to restaurants, usually, for the food!). I cannot express in words how much I love this restaurant. I have told a number of friends about it and they all have loved it, many of them now go once every 2 weeks or more." "I love this place. I have worked nearby this gem for 3 years and go quite often. At lunch, it is not glamorous inside, but it is done up very nice for dinner. Their lunch specials are phenomenal (final bill with tip can be as low as 20 bucks for two people) and their food is out of this world. i have never had a dish that I did not like. I drink a lot of water when I eat spicy food and I never have an empty glass as their wait staff is very good. I especially like their pad gra prow and pad tua. You are missing out if you don't try this place!"